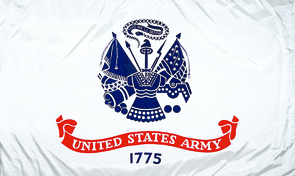 The U.S. Army was originally born in 1775 under General George Washington. However, it wasn't until June 12, 1956, the Army's 181st birthday, that the official flag was adopted. Featuring the national colors of red, white, and blue, the U.S. Army is a symbol of strength, defense, and national pride. Featured on the center of the white field is the official war seal in blue, which represents all the elements of the Army. United States Army is written on a red scroll underneath the seal, and the year 1775 below that. Above the seal is the official Army motto, "This We'll Defend," to remind all citizens of the Army's constant readiness to defend and preserve the United States of America.